Item number 2508/5 from the MOA: University of British Columbia. 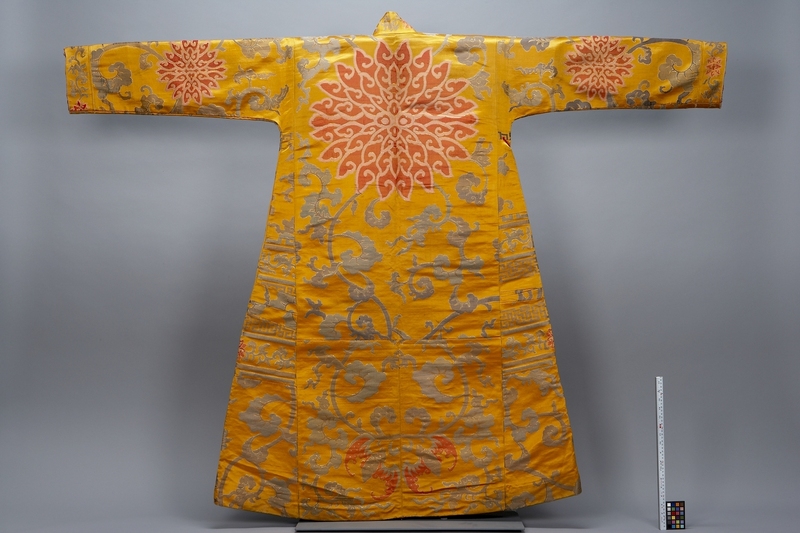 Object is a long, yellow-orange, brocade robe. 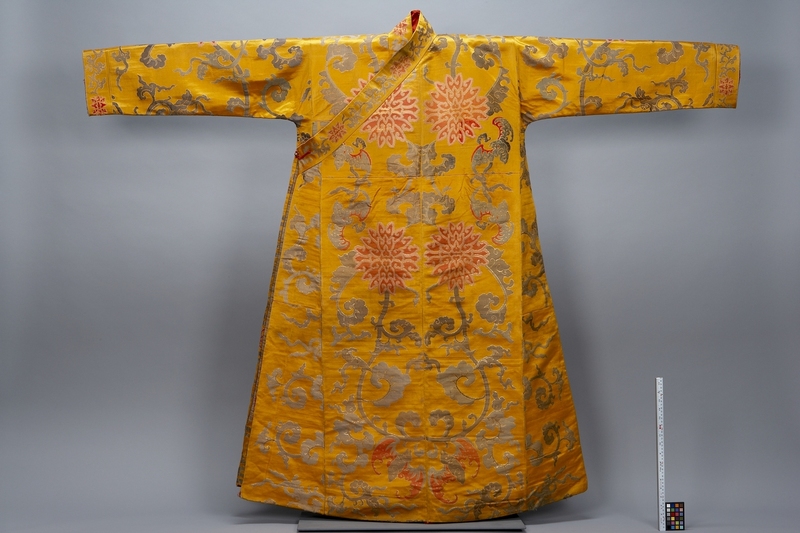 Robe is decorated with images of dark red and light pink lotus blossoms and bats, located symmetrically on front. Large lotus blossom on back of robe. Robe has an overlapping front with one metal ball-and-loop fastener. Underflap has grey geometric patterns on it. Robe has long and tapered sleeves. Yapshi-Yuthok Kalon Tashi Dhondup Collection: The title Yapshi is given to all families that have a Dalai Lama born into the family, and Shape and Kalon are titles that the four lay Cabinet Ministers hold. The Yuthok family is descended from the 10th Dalai Lama, Tsultrim Gyatso. Being a Minister in the Traditional Tibetan Government, Yapshi-Yuthok Tashi Dhondup was also known as Shape or Kalon Yuthok. There is one item belonging to Kalon Yuthok that is in the collection of the Metropolitan Museum: a Tibetan saddle, which he used on special occasions and during the Tibetan New Year when he would go to the Potala Palace. It was the wish of the late Mrs. Tsering Dolkar Yapshi-Yuthok that the museum display the family's heirloom textiles so that visitors could learn about Tibet's rich history and culture.